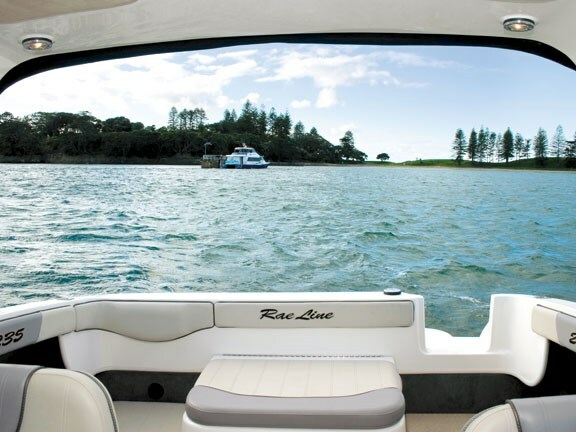 Rae Line Boats is a Kaiapoi company that started life as a gel-coat and fibreglass repair shop in 1992. Founder Peter Rae learned his craft in the home of immaculately finished fibreglass construction – the USA. 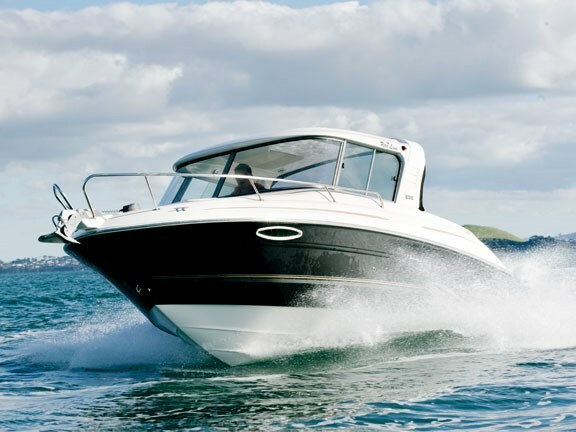 This work, and his relationship with New Zealand and Australian Sea Ray dealer, Sports Craft, culminated in Rae Line being offered the opportunity to build these iconic American boats under licence in 1998, a first for the brand anywhere in the world. 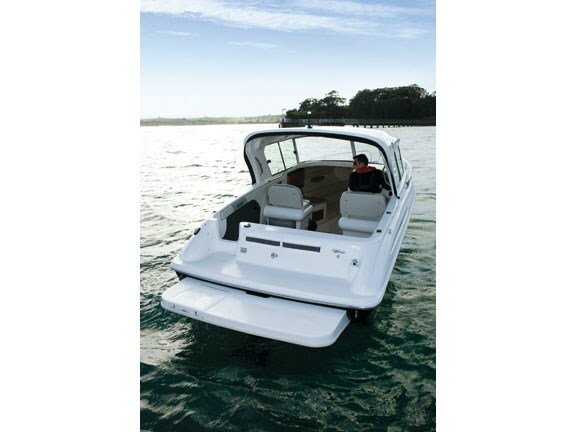 This hardtop version of the Sea Ray’s sports hull is not particularly large, with an overall length of 7.7m, however its significant beam of 2.59m gives the cabin a roomy feel. 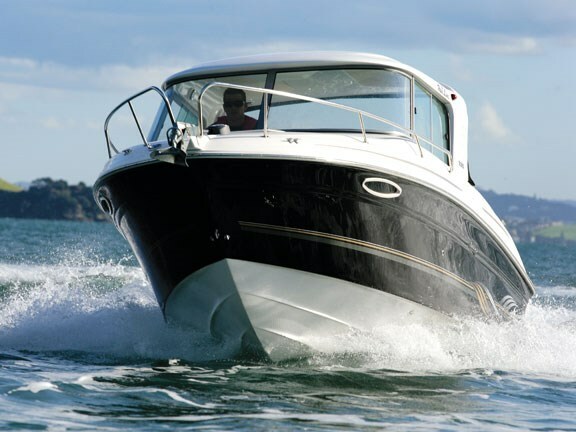 The vessel we tested was a Sea Ray hull rebranded and modified by Rae Line Boats with the parent company, Brunswick’s, permission to suit the New Zealand market. Every aspect of the construction is completed in New Zealand. Boarding the Rae Line H series 235 is best done via the substantial swim-step. Once on board you immediately feel like you are on a much bigger boat. It is stable underfoot and more spacious than you would expect. There is a fully lined cabin forward featuring a ¾ berth that most couples would find adequate for a night or two. There is a fully enclosed head and sink that includes a shower head. 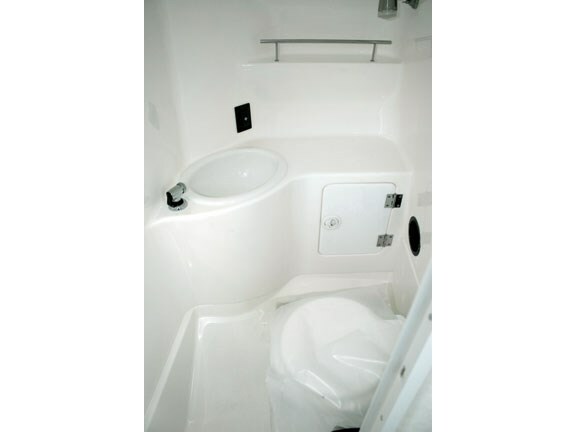 The boat comes with a cold water supply as standard but hot water is easy enough to option in. 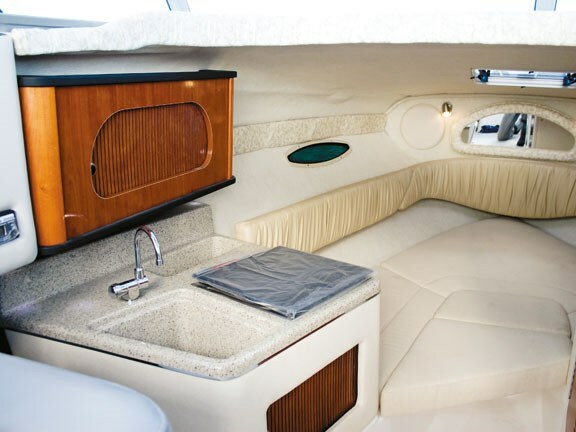 The port side features a quite serviceable kitchen unit with a sink insert and two-hob gas cooktop. To save space, and for practicality purposes, there is no gas bottle to worry about. The fuel is provided for by the little pre-filled canisters mountaineers favour. Changing the canister is a one-minute operation. Comfort is the overriding theme of the Rae Line. The seating is plush and quite luxurious – although a back-to-back option on both the helm and co-pilot seats would allow for more passenger seating in the shelter of the cabin. Turning the dickey seat located in the rear of the boat into a fold-away would free up space in the rear, but regardless, this boat is superbly comfortable. Rae Line has targeted the family cruising market with this model and the cockpit configuration reflects this. 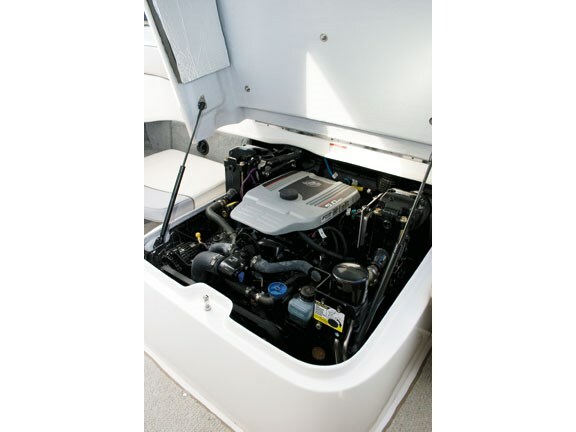 The MerCruiser powerplant does not overly intrude, and with its height and soft top cushion, the box doubles as an extra seat. There are enough rod holders to keep the average fisherman happy and to entertain the little ones. "Bigger" kids will be delighted to find a towing eye attached to the transom. There is a showerhead built into the transom above the swim-step. Taking the helm of the Rae Line 235 really is more akin to driving a car than a boat. Apart from the bright white glass finish, the dash would not look out of place in a quality motor vehicle. 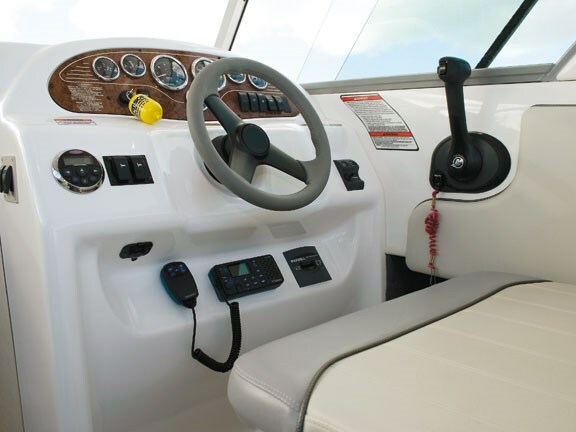 The chromed gauges are set into an imitation wood panel and, rather than the standard switch panel, the dash features large individually mounted switches like you would find on a 50’ luxury cruiser. The curved glass windscreen affords superb visibility for the driver. Pushing the throttle the power delivered by the 5L MerCruiser petrol engine is impressive and we were quickly and comfortably cruising at 30 knots beam-on to 20 to 25-knot gusty wind chop. The ride in all directions relative to the sea was comfortable enough. We had to reduce speed due to the reduced visibility we experienced with the amount of spray hitting the windscreen, which is to be expected in any boat in these conditions, but the application of a water-repelling glass treatment is a must. A set of wipers would be even better. We found the Rae Line 235 to be remarkably easy and predictable to manage in tight situations. The precision of the helm and the throttle control allowed the skipper to apply the small burst of power needed to counter the wind with confidence. We also found this boat easy to control at speed. At times the sea built to the point where it was necessary to throttle back, yet trimming the hull would allow us to maintain a very slow planing speed with little load on the engine. 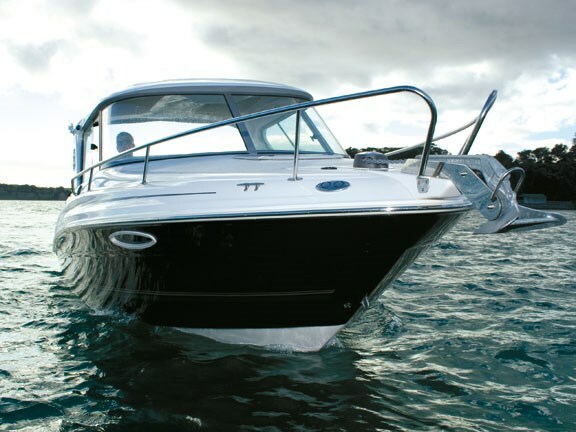 The trim tabs are almost too effective, as it is possible to push the nose far enough down to get the vessel to bow steer – a problem fixed instantly by reducing the trim slightly. Back at the boat ramp the fully rollered trailer made the task of getting what is quite a big boat out of the drink very easy. 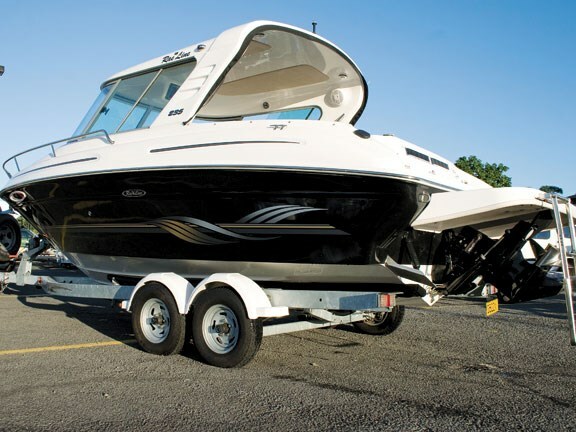 The precise helm and throttle control allowed us to just drive the boat straight up on the trailer, bolt the safety chain in place and tow the whole lot up clear of the water without getting wet feet or having to crank the winch handle – perfect. 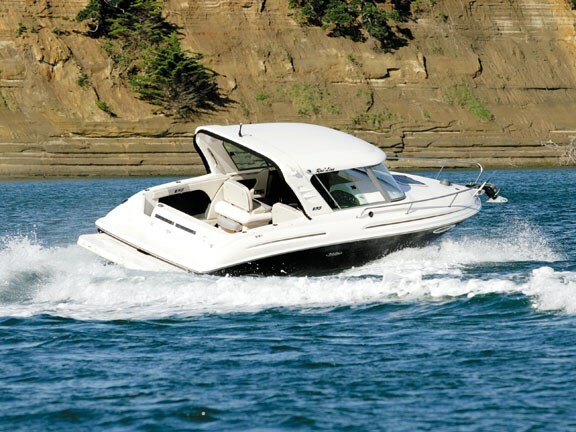 The Rae Line H series 235 is a moderate sized trailer boat that cruises like it is a small launch. That said, it is easy to handle and not at all intimidating. The ride is superb and with that much power under the hood getting home is never going to be a concern. See Rae Line boats for sale. For more information or to book at test drive, ph 09 9144531 or visit www.raeline.com.